2 Arrange green beans in roasting pan or on baking sheet; toss with olive oil. Roast, turning once, 15 minutes or until lightly golden brown. 3 Meanwhile, combine Hellmann's® or Best Foods® Real Mayonnaise, dressing, lemon juice, and shallot. 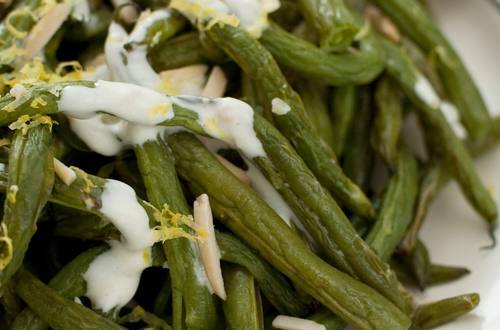 4 Drizzle green beans with sauce, then sprinkle with almonds and lemon peel. *Also delicious served at room temperature.